Ever since their inception, cloud storage and backup have become very popular, particularly in the modern market where new cloud storage offers are launched almost every other month. Finding cloud backup services should not be a daunting task. However, distinguishing the best offers from the rest can be a real challenge if you do not know exactly what to look for in such services. Most companies that offer these services provide attractive websites highly designed for marketing purposes where they show the key features they want you to know about. The problem is they often fail to explain how these features work and why such features are important in the service. Ironically, this explanation is what makes the very difference between features and benefits. As a consumer of cloud backup and storage services, you should be more interested in the benefit and not the feature. Idrive is one of the popular cloud backup services available to those looking for such services. Here is a descriptive review of the service including what it is, the features offered and the benefits you can draw from using this cloud storage. As aforementioned, idrive is a cloud service that mainly offers storage and backup for all your files, folders and digital media. To effectively offer storage and backup requires various considerations and measure including security, instant access, improved user experience, unlimited space and issues of affordability. With many free services available in the market, cloud storage and backup should not be all that expensive. However, these are only the surface concerns. When it comes to cloud backup, aspects such as security, data restoration, support, plan variability and internal transfers are more important. 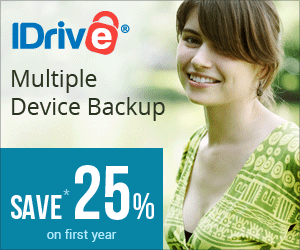 Idrive online backup service is one of the cloud storage offers available in the market. Use the promo code: cloudstoragebuzz.com to activate the 25% off discount. Cloud backup services are all about providing unlimited storage space where you can back-up all your digital data and retrieve them on demand from anywhere in the world. Idrive offers many other minor features within their plans and service to make sure cloud storage is as effortless and seamless as possible. Personal plan – This is a $49.50 cloud backup service that allows you to store up to 150GB data on 1 PC. The plan is ideal for individuals who simply want to keep a backup of their photos, videos, personal projects, school work, certificate copies and any other digital data or media. The $49.50 price tag is for annual backup. Family plan – This plan suits families like the name suggests. It offers 500GB of storage for up to five different PCs. It is ideal storage for all your family photos and clips. Business plan – This comes in various business plans that start at 50GB although there is a “big brother” version called IBackup that businesses will find quite attractive. This allows any number of PCs and will be priced based on your business requirements. Idrive unlimited – This is similar to the personal plan with the only major difference being the opportunity to store an unlimited amount of digital data and media. You simply won’t be able to exhaust the storage. However, there are a various restrictions you should read through before choosing this plan. Idrive offers various kinds of backups to incorporate maximum flexibility for both individuals and businesses. Some of the popular backups you can use include scheduled backup, continuous backup, manual backup, open file and locked file backups. For scheduled backups, only one schedule is allowed at a go while continuous backup excludes files that are bigger than 500GB. Open and closed file backup are support services for local files only (open file) as well as mapped network drives. Manual backups can be executed the same way you access files on Windows explorer (right clicking on the file). It is important to note the difference between the backup and storage features. “Backup” allows you to store filed on idrive cloud servers while still retaining the same files on your PC. Choosing the “Storage” feature sends your files to the cloud servers without retaining a copy on your PC. These options are suitable for various needs, but it should be noted that resetting encryption key can be overwhelming if the “Storage” option was chosen, especially since this reset requires complete deletion of the account for a new one to be created. Before any data leaves your PC into idrive cloud servers, it is encrypted with AES-256 encryption. Users have the option to use default idrive key or provide their private key. It is recommendable to use a private key as this prevents anyone at idrive from accessing your data. You are the only one who can decrypt your data. The downside of private key surfaces when you lose your key; it renders your backup worthless. It becomes even more overwhelming when you have to reset the encryption key. The account must first be deleted and a new one created, which can be inconveniencing if you have loads of data to upload or if you used “Storage” instead of “Backup.” Before you upload all your data, it is advisable to send only a few and then perform a test restore to make sure you have the correct logins and passwords. Nevertheless, you should still go for a private key if you want to boost security. This is one of the amazing features idrive cloud backup services come with. The initial physical hard drive transfer resolves one of the biggest impediments to online backup services. When starting out with cloud backup, sending your hard drive’s content can take several hours or even weeks, eat up a lot of bandwidth and put some of your data at risk during the whole process of this initial transfer. To solve the problem, idrive gives you a free 1TB (1000GB) physical hard drive to backup all the data you want to transfer to their cloud servers and ship it back free of charge. Idrive pro users can enjoy this service once every year for personal accounts and three times per year for business accounts. What’s great is you do not have to pay anything and the data is heavily encrypted to prevent any unauthorized access while it is being shipped. Idrive Express also makes it easy to perform quick data restoration if you do not want to wait for the internet-based restoration that may take even longer to download all the files. Idrive supports external hard drives and adding them is a relatively easy process. Simply use the desktop application provided to choose the drive letter and immediately start backing up your data. There is also support for mapped network drivers. The procedure of adding network drives is no different as you can see and pick their names from the desktop application. There is mobile support for apple and android devices through idrive apps although this access still features various limitations. Users can mostly access their files, download and open them if they are supported by their mobile devices. Although this support seems limited, the apps are being improved and will soon allow more functionality. Of all things possible using idrive cloud backup, users working behind managed firewalls may experience the biggest stumbling block. Such users are required to open up a few ports to allow communication between idrive servers and their PCs. These series of firewall ports to be opened ports include 11700 and 11900-11990. 11700 used to be 11610-11670 but idrive performed new upgrades so previous users may need to make a small change although this information was probably already communicated to them. The same idrive desktop application that allows you to select external hard drives and back-up data can be used to restore a file. The wizard explores your cloud storage which means you can select a particular file to restore. This is integrated software that allows you to view your storage partitions in the cloud. You can also restore files and folders using the explorer. This requires the use of a private user key to perform file restoration although it is still very easy to achieve provided you have the key. This option is available for those who want physical storage restoration. For $69.95, idrive will send you a 2.5 inch 350GB external hard drive containing your data. However, the data should be able to fit on 350GB of space. It is ideal for those who want to retrieve a lot of data. One of the important aspects of cloud backup services is professionalism characterized in communication and support. Because cloud backup is internet-based, it can be quite overwhelming from time to time and you may need technical support to get through various milestones. Idrive offers toll free customer support Monday to Friday 6am to 6pm. If you are in need of support outside these hours, you can still communicate via online live chat, email notifications and web requests. Idrive also offers other support features like delayed deletion. If you delete a file from your computer, idrive will still retail a copy for the next 30 days just in case you need it back. However, trying to retrieve missing files after 30 days may turn into a daunting process that involves data recovery. This is another feature available in idrive cloud backup services. Backing up data can make you computer very slow and interfere with other internet services. If this becomes a problem for you, you can choose the option to limit bandwidth and boost computer speed. Limiting bandwidth simply improves the bandwidth sharing environment and allows you to achieve fast web surfing while backing up your files. The company has been offering cloud backup services for about 10 years and has optimized their network to sustain fast internet speeds and uploads despite the size and nature of backup required. All data is replicated across idrive’s 4 data centers to ensure effortless restoration even if one data center goes down. When looking for cloud backup services, security, storage space, customer support, data restoration and speed become the top priorities to examine. Idrive performs quite exceptionally in all these areas. The company also enjoys a lot of experience from their many years in the industry and has improved service delivery frameworks in the market. When compared with other top cloud storage and backup services, idrive performs much better and has several trademark benefits you will not find in other offers. Unless synchronization is your biggest worry, idrive is simply the best inexpensive cloud storage and backup service you can hope for. It is also very easy to use and there are several features to make cloud storage effortless and fun. In many ways, there is no doubt that idrive is a better choice that will not disappoint you.